Sauerkraut, a popular dish in Germany, is pickled white cabbage, both salty and sour. The salt monopoly during Fredrick the Great’s reign may have led to the way in which to preserve sauerkraut, thus creating its flavor, according to “The Home Book of German Cookery.” Served as a side dish to German sausages, you can eat it cold and raw as well as cooked to increase the flavor. 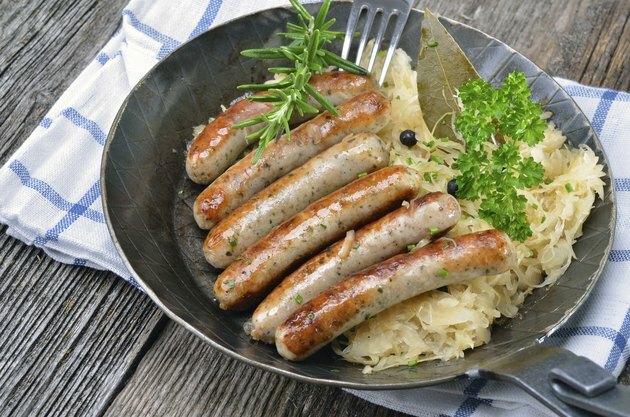 Enhance the taste of your favorite sausage by mixing it with cooked sauerkraut. Drain 3 lbs. of fresh or canned sauerkraut in a colander. Press out the excess liquid and rinse if the sauerkraut is too tangy. Melt 4 tbsp. of butter in a large cooking pot over medium-high heat. Add 1 large minced white onion and 2 medium-size apples, peeled, cored and chopped. Sauté the onions and apples until the onions are translucent and the apples are golden brown. Stir the drained sauerkraut into the apples and onions. Add 2 tbsp. of brown sugar and 1 tsp. of caraway seeds. Stir well and cook covered for 10 minutes over low heat. Pour enough water in the pot to cover the sauerkraut. Cover and cook on low heat for 1-1/2 to 2 hours. Add additional water during cooking to keep the sauerkraut covered. Mix 1 tbsp. of flour with 1/8 cup of cold water. Stir the flour mixture into the sauerkraut and simmer over low heat for 2 to 3 minutes to thicken the liquid. Cut 2 to 3 lbs. of smoked beef or turkey sausage into 1- to 2-inch pieces. Stir the sausage into the sauerkraut and cover. Cook over low heat until the sausage is hot. Try a variation with different sausages, such as cooked bratwurst or knackwurst. How Do I Cook Packaged Sauerkraut?